They say “April showers bring May flowers,” but spring’s rain can also bring damage to a structure’s roof, foundation, interior and more if not properly waterproofed. Water is moved through a structure via any number of forces including: hydrostatic pressure, capillary action, wind/air currents, surface tension and natural gravity. If there is any breach in a structure’s envelope, water is sure to find its way in. Waterproofing has come a long way since 1915 when cutting edge technology Ironite was first introduced. Painted onto the inside of basement walls, Ironite became a popular option because it could be applied quickly and it was less expensive than traditional waterproofing methods at the time. The exterior walls of a building can be a significant source of unwanted water leakage. 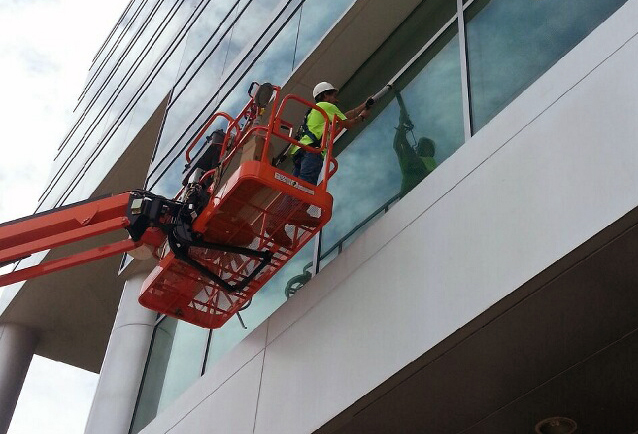 It’s easy to forget how many openings are required in commercial building walls – from plumbing and irrigation connections to lighting, HVAC system elements, exhaust vents, air intakes, joints around windows and doors, and fire alarms, to name a few. A wide range of restoration, repair and reinforcing services are offered by certified, specialty contractors who can repair cracks, spalls, rust spots, deterioration, pot-holes and heaves in concrete and masonry. More often than not, concrete repairs are made before they become a more serious or costly issue, but there are measures that you can take to actually prevent future damage. Applying hot applied or below grade waterproofing to your buried structures, a urethane waterproof traffic coating to your parking decks and protective acrylic coatings to your pedestrian areas and exterior facades will extend the life of the repair, protect adjacent areas that are currently in good condition and significantly improve the aesthetics of the area treated. Applied over concrete, wood or steel, a variety of deck coatings are available to prevent leaks from penetrating to areas below and can maintain the surface’s color and keep it looking like new for years. Recent technology has provided materials for these special coatings that are ideal for suspended slabs, recreational roof decks, garages, patios, balconies, sun decks, areas around pools and other areas that require a durable surface. A commitment to good roof maintenance practices can prevent overflowing gutters, clogged downspouts and excessive ponding water which can lead to costly roof, facade and foundation damage. A number of excellent below-grade exterior foundation waterproofing systems have become available within the last 20 years for preventing water penetration through basement walls, concrete lids, pits and other below-ground areas. These waterproofing materials may be applied on the inside or outside of the wall or foundation. Fluid-applied elastomeric membranes, mastics and coatings that form a tough, seamless membrane to withstand abuse and high levels of hydrostatic pressure. Hot-applied rubberized asphalt for horizontal waterproofing in split-slab construction and insulated roof membrane assembly roofs. Single-ply sheet systems such as rubberized asphalt sheets, EPDM synthetic rubber, PVC, CPE, CSPE, Butyl rubber and Neoprene. Metallic, capillary/crystalline and cementitious materials are currently available for waterproofing a structure’s interior. These materials may be applied by brush, trowel, spray or dry-shake methods to concrete or masonry substrates opposite the source of moisture. For foundations, these materials are applied to the interior of the structure. For tanks, reservoirs and other structures that hold water, these materials are applied to the exterior. Waterproofing plays an extremely important role in protecting every aspect of a structure’s construction. Knowing which waterproofing coverage to specify for a particular structure is more than just a science; it is an art form. 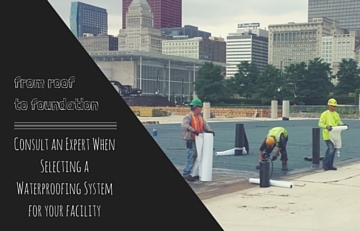 Always consult with an experienced specialty contractor for the best options when waterproofing any part of a structure.